Every time I browse the dairy aisle, there seems to be more and more brands of milk. It seems that stores like to stock its favorite brands, or should I say their customers’ favorite brands, so you often see new comers in various stores. 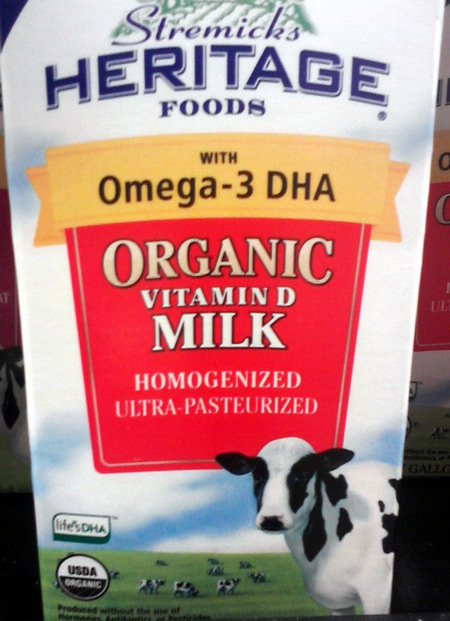 On a similar subject I recently posted a few cow logos I encountered on milk cartons at Target. I don’t hang out with cows on a daily basis but I can’t stop looking at this one and think it has suffered from major Photoshop abuse. I don’t think I’ve ever seen a cow with such a round dome on top of its head (is this a dolphin’s melon???). As for the black markings on its face, they look freakishly symmetrical: two completely black ears and two black vertical bars over the eyes, with the same shape…. Wacky cow! Now, that’s what I call a funny looking cow and I love it! It looks very happy, clearly high on that fresh, organic grass, and the bottle sends me messages of love (pink heart) and heavenly glow (halo). What’s not to like about this milk? I can’t wait to see what other dairy farms come up over the next few months. Wacky or cute, you’ve just got to love them! Next Post More happy cows in my kitchen pantry! I’ve never seen a cow in real life with that rounded of a head, LOL…makes me wonder if whoever photo shopped it had ever seen a cow in real life! Not to mention, under the neck seems a little too rounded as well! Dome on the head, but also, what is that lump on its chest? Ew. I know! It’s very disturbing. That cow doesn’t make me want to drink that milk at all. It’s one of those “what were they thinking” moment. Again . 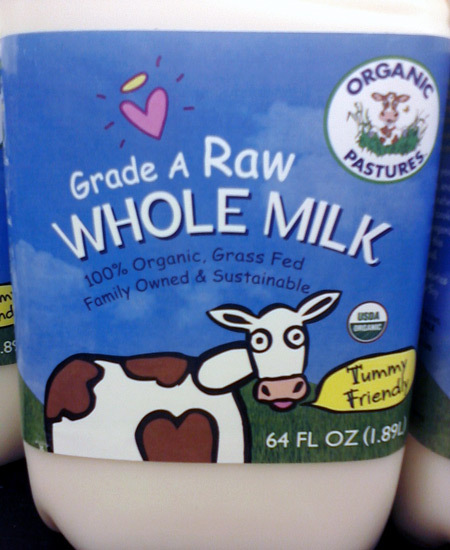 . . how many eyes were on that cow before they put her on the carton?